red ONE, the only postpaid MVNO in the country, is now offering device bundles, allowing you to get selected Huawei phones or tablet from as low as RM0. The telco is offering the Huawei Mate 7, MediaPad X1 and Huawei Y221 with its postpaid plans from as low as RM8 a month, paired with an internet plan. A 12 or 24 months contract applies. 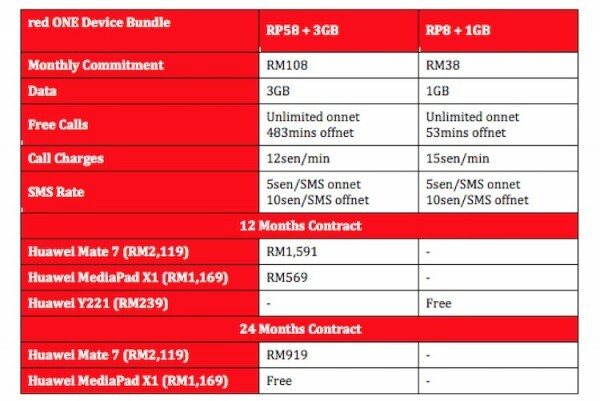 red ONE’s device bundles works a little different compared to the usual phone bundles from other telcos. You will need to pay the retail price of each device upon subscription, and red ONE will give you monthly rebates for the duration of your contract. Huawei Mate 7 and MediaPad X1 gets RM50 of rebate each month, which means you only pay RM58/month for 12 or 24 months depending on your contract. As for the Huawei Y221, pay the retail price of RM239 upon subscription and get RM20 in rebates each month for 12 months. Check out red ONE for more information about its device bundles.